Seek and you will find…but not with us! Thanks to an index you will find at once what you are looking for. Designed with colors or black & white indexes are a good way to increase the value of your print product. Eyecatch help to positively stand out of the mass and turn your bound staple of paper into a unique print product. Refine your catalogue or brochure with a function key called INDEX. The Index Cutting Book – A Guideline presents in a clear structure our range of services, several cutting samples and all necessary technical information for a smooth and satisfying production. It provides a good overview of all topics, where index cutting is concerned. This will give you a better picture of our quality and what is possible when it comes to indexing. Order today a free copy and you will receive it within the next days. Sometimes you simply need to take a product in your own hand to experience how handy and elegant it is. 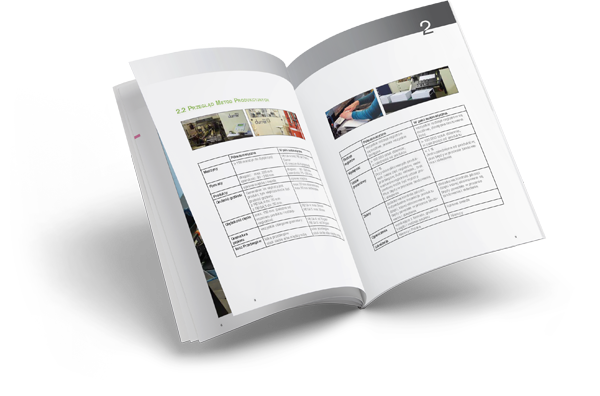 Additionally you can download The Index Cutting Book – A Guideline as pdf-file. Simply choose a language and click on the link to the right. Should you have any kind of question regarding an order or the general proceeding, please, do not hesitate to contact us. We are pleased to assist you. You can call us, write an e-mail or use the contact form which you find on our hompage always on the right side. We recommend to send us the print file before printing it. This gives us the oportunity to check, if the book’s design is suitable for an index and if index marks are placed correctly. Usually, we are cutting an index in printed and bound print products which are already cut to its final format (netto format). In case of hardcover books it eventually is more economical to send us just the book block and to finish the binding after index cutting. After we have received the books we are cutting a sample and send you pictures of it via e-mail. Only if you are satisfied with the result, we start with index cutting. Further down the line we are offering you several packing options: in boxes, in shrink-foil or packed in packages by a plastic strap. Of course you can organize the transportation yourself. Yet, you are welcome to get a separate offer – the only thing we need is the postal code and country of destination. To realize our potential and to assure that we always comply with your request to the fullest satisfaction, we developed a whole range of quality arrurance measures. Our quality assurance and your guarantee for an optimal production: Continuously ongoing training and further education of our employees. In advance of each production we produce a dummy, take pictures of it and ask you to provide us with a productions release before we start with the actual production. This procedure gives you the control to make sure that we cut the index in the way you want it. Our machine operators get for each project inspectation instructions. QA 1. degree – every book is individually taken into hand and checked. QA 2. degree – before putting the books back on pallets they are checked once again by an employee of the QA team. QA 3. degree – the production manager is examining the books from the running production on a random basis. As a standard we are closing every pallet with a wooden toping, cardboard for the corners, 3-4 plastic straps and several layers of strech foil. Before loading your packed pallets are stored well protected in our warehouse. A good a legible labeling of pallets incl. a barcode garanties the correct loading of trucks. Together with our inhouse process manager all processes are constantly checked, assesed and improved. If you have despite our QA guidelines cause for complaint, we are open and happy for any constructive criticism (…also a positive feedback is always welcome).